The United Kingdom consists of England, Wales, Scotland, Northern Ireland and some smaller islands. Great Britain's show laser market is not yet completely opened up, although Scotland's laser industry for industrial, medical, military and safety purposes is stronger. In order to serve the british show laser market, Laserworld set up the Laserworld UK Ltd. in 2012 south of Manchester. Besides sales and support for Great Britain and Ireland the UK operation comprises the event production and installation sector as well as retail. Great Britain has got lots of festivals and parades during the year, e.g. the Liverpool International Music Festival on August, the 25. 2013 with various international artists. Festivals and lasers are an ideal combination as the laser systems underline the beats of the music and are able to integrate the spectators to the show. The Middle East comprises the countries of the former Ottoman empire: Egypt, Syria, Lebanon, Israel, Palestine, Jordan, Saudi Arabia, Bahrain, Kuwait, Oman, Qatar, United Arab Emirates, Yemen, Iran and Iraq. Also Turkey counts to the traditional Middle East. The demand for show laser systems on these markets has increased more and more because of the general growth on these markets during the last years. Yet these are not completely opened up in the showlaser branche. 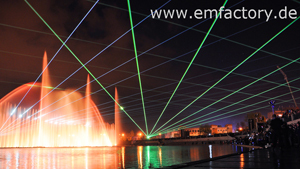 However, some of the countries of the Middle East provide ideal conditions for showlaser applications and lasershows. Regions like Egypt, the Lebanon or the countries of the UAE are popular travel destinations, that offer everything, a tourist desires: long traditions and culture, tourist attractions, warm temperatures, beaches and seas. Scandinavia geographically denotes the Scandinavian Peninsula and consists of Norway and Sweden; historically and culturally also Denmark belongs to Scandinavia. If we refer to Scandinavia the term often includes Finland, Iceland and the Faroe Islands, that are associates historically with the three Scandinavian countries. Although Scandinavia has got it's own, quasi "natural lasershow" with the aurora borealis during the winter months, the demand for show laser systems in the Scandinavian countries grows. Laserworld and its partners and clients already did some awesome lasershows there, some examples: the Electronic Festival in Aarhus - Elektronik III Ridehuset, Denmark, the Birkerod event in Denmark or several events in Sweden. India belongs to South Asia and lies on rank two of the most populated countries of the world. It is regarded as newly industrialised country and is one of the fastest-growing economies worldwide. India's impressive market growth also applies for the technological sector. Therefore also show laser technique gets more important. Even the tourism branche grows, hence more occasions for laser light shows arise. But besides touristic venues also official events may be accompanied by laser or multimedia shows, to create special and fascinating highlights. Possible official events and festivities that might be underlined by showlasers could be the Republic Day of India on 26. January or the Independence Day of India, taking place on August, 15. and commemorating India's independence from British rule in 1947.